A shocking photograph circulating online shows a poacher in Thailand sitting on top of a bloodied tiger, drawing his fist behind his head. The photograph was recovered from a mobile phone seized by Thai police after they arrested a Vietnamese poaching gang operating across four countries, reports The Sun. It appears to show the poacher punching the tiger. 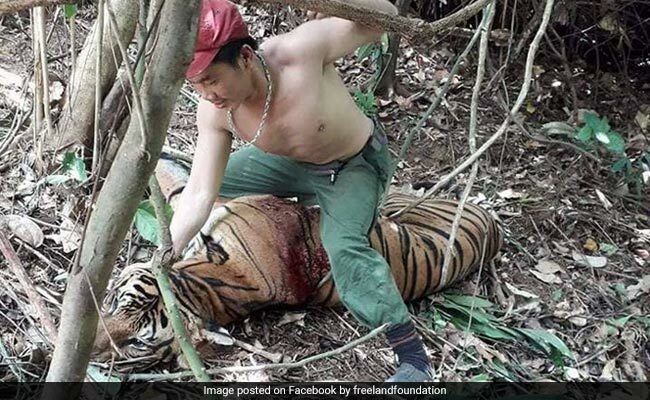 "New findings from a three-month investigation reveal professional gangs were dispatched across borders to target the wild tigers in Thailand, Malaysia and perhaps further," wrote Freeland, an organisation that works against wildlife trafficking, sharing the picture on Facebook. Gang members had a whole tiger skeleton in their car when they were stopped by the police, acting on a tip-off, back in October 2018. A picture of the skeleton was also shared on Facebook by Freeland. Two Vietnamese nationals were arrested in connection with the poaching. The shocking photographs, meanwhile, have elicited huge outrage on social media, with many asking for death penalty for the poachers and calling the pics "sickening" and "awful". According to the Daily Mail, tiger skeletons and bear claws are in high demand in many countries, especially Vietnam. Petcharat Sangchai, director of the Freeland, said: "Tiger skeleton is the crucial ingredient for making a tiger bone liquor, which is believed to be a health medicine for elders." ""This gang has been removed as a threat, but we should be aware that whoever employed them may dispatch more hunters to kill our country's tigers," he added.